Subject: Restore LimoWiz Data - Tutorial. 1. Click on Restore Data radio button. 2. Click Yes on the warning box. 4. Select the backup file from the Open archive. Then click the Open button. 7. A message will appear telling you where the data will be extracted to (restored to). 7. 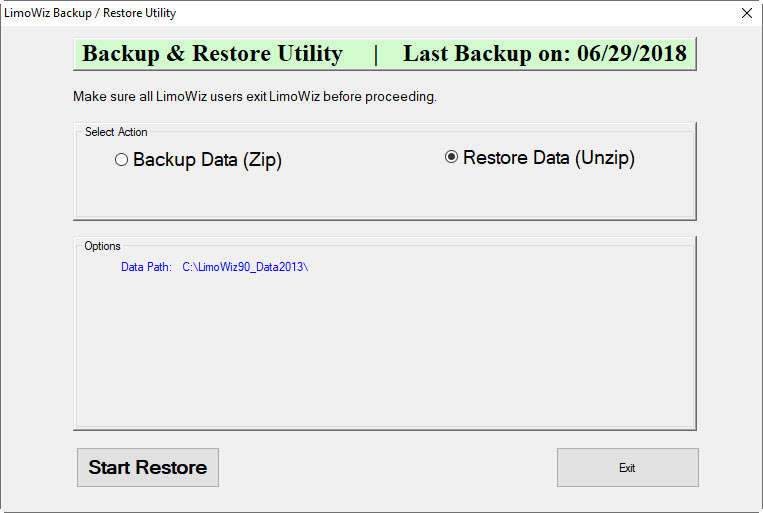 LimoWiz will do some quick processing of backup data, then it will prompt you to a message, Click Yes to All. 8. Restore Completed message is completed. Click Ok to index.